I’ve made some pretty great friends through this blog. 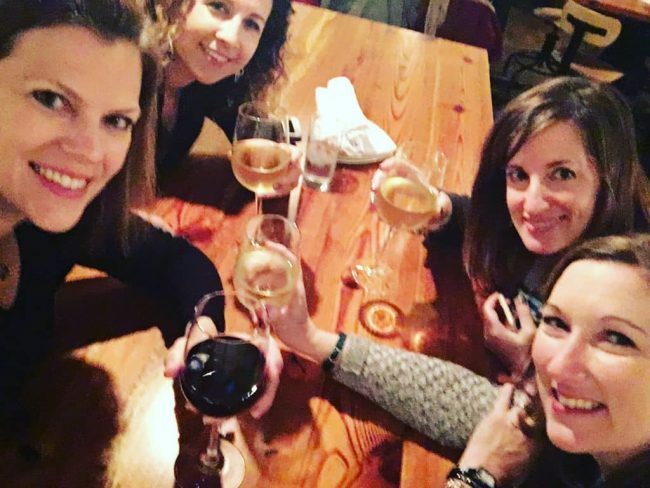 Of course I’ve connected professionally as well, (it’s how I ended up working for BabyCenter) but my blogging buddies are irreplaceable. 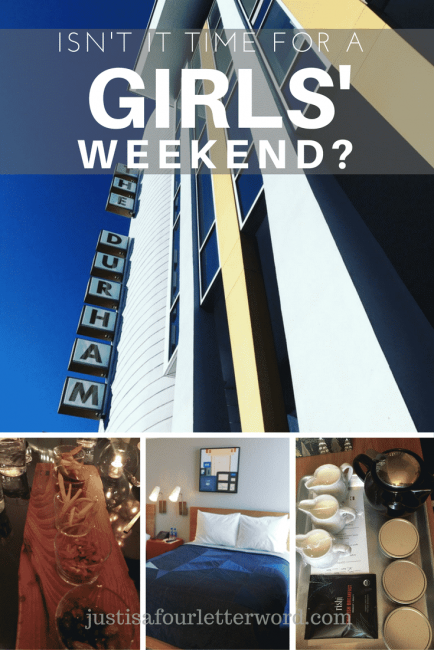 If you told me 5 years ago that I’d be taking a girls’ weekend at The Durham Hotel with three other bloggers, just for fun, I’m not sure I would have believed you. As I’ve attended various blogging conferences over the years, I began rooming with the same people. Sharing a room with someone is a pretty personal thing and I’ve noticed that as I get older, I’m definitely pickier than the “I’ll sleep anywhere” attitude of my youth. Conferences are busy and can be expensive due to location and travel so I always love saving where I can. Erin, Fadra, and Melissa mean far more to me than savings at this point though and over the past few conferences where we roomed together, we decided that we shouldn’t need to rely on business trips to get together. We actually connected here at home years ago as Raleigh, NC bloggers. We all lived within 30 minutes of each other and while we were typically running in separate circles, we became friends over the years. When Fadra moved out of the state, we used conferences as mini-reunions and sometimes even us locals wouldn’t catch up much in between trips. This year, Melissa turned 40 and said you know what? Let’s have a girls’ weekend to celebrate! 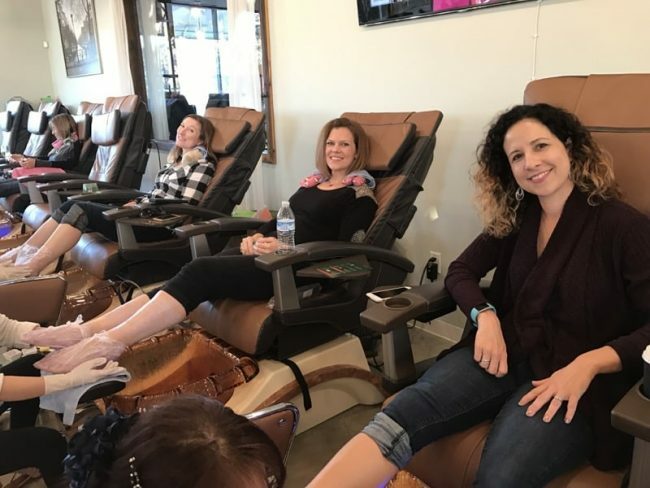 It was early December before the holiday season really took off and we all jumped at the chance to have a little pampering before the craziness of the season kicked in. 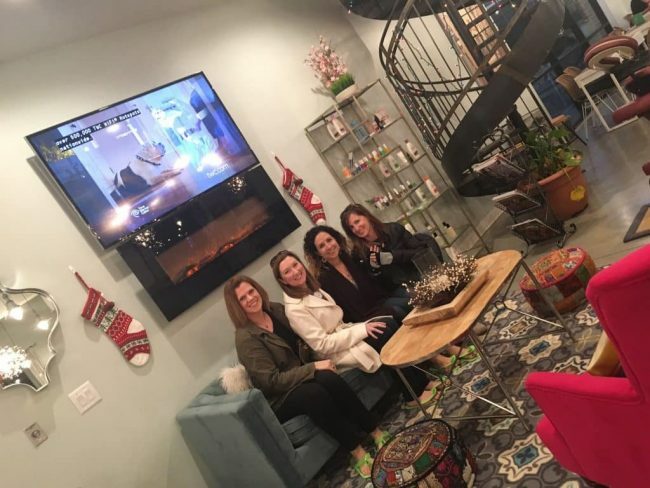 We started the fun at a Durham salon called The Nail Stop. Despite the unassuming name, I have to say this place was fabulous! It’s a large space with just about every amenity you can think of, including a full bar! The things I do for my friends. 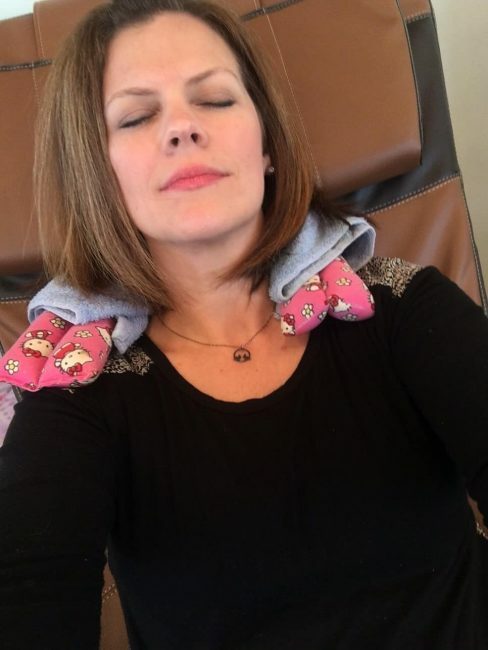 This heated neck wrap was amazing along with the massage chair and paraffin wax dip on my feet. Heaven! Since Christmas was around the corner, I went with a shiny red sparkle for my toes. We had a great time at the Nail Stop and I hope to make it back over there sooner than later! After we were nice and relaxed it was time to head over to The Durham Hotel, located in the downtown area. 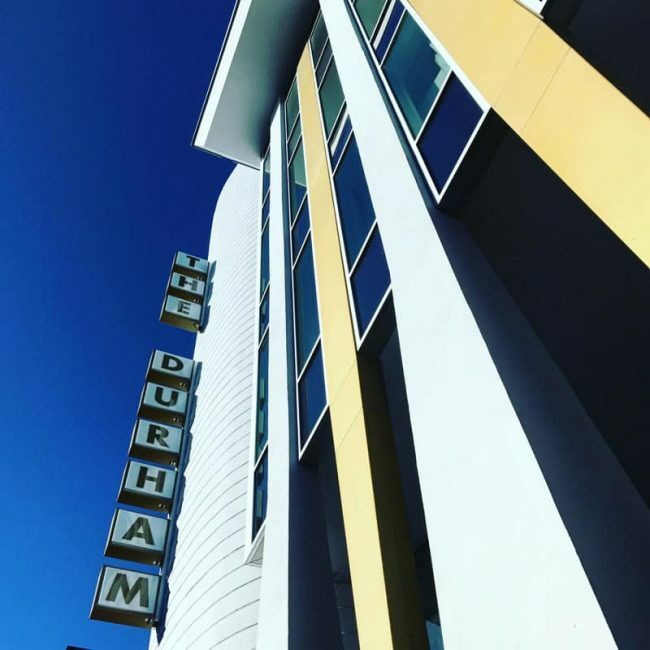 I’ve been to Durham many times, but this was my first overnight in downtown. I loved it! 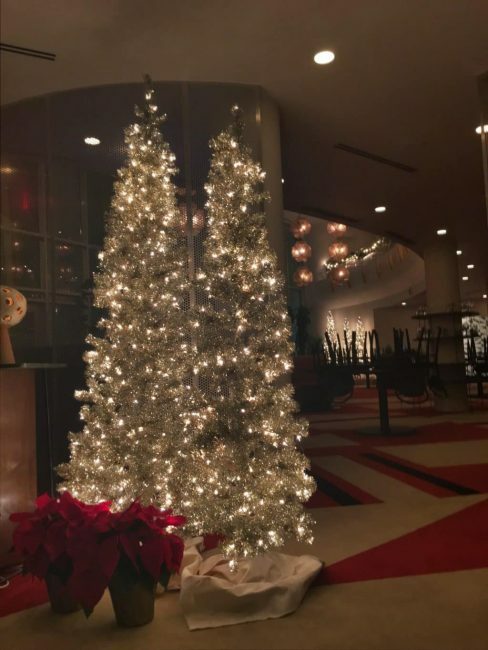 The mid-century modern design of the entryway and lobby hotel was both fun and welcoming along with plenty of holiday touches and stunning lighting. 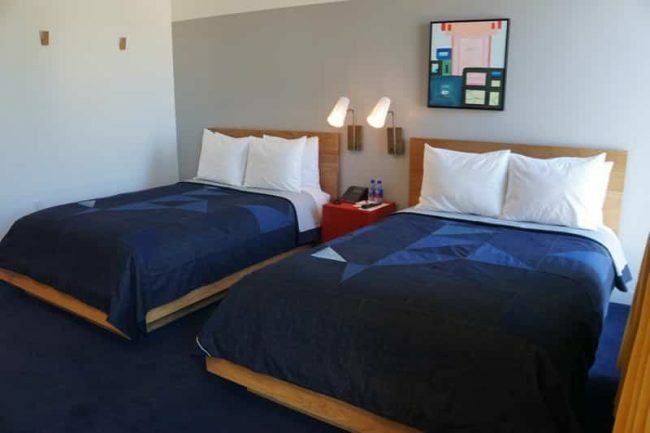 Our room was plenty big for the four of us and it was a lovely touch to see that the denim quilts on the beds were locally sourced from Raleigh Denim! You can check out other local collaborations on the website as well. Since this was a celebration, we came bearing treats! 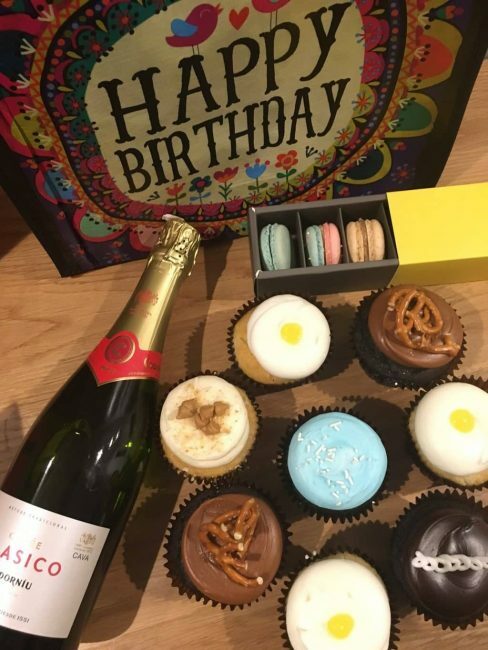 Fadra got the most amazing cupcakes from Smallcakes and of course some champagne and I showed up with a little taste of Raleigh; macarons from lucettegrace. Time to party! We headed downstairs to sample some delicious small plates and kick off the evening with a few cocktails in the lobby restaurant. Everything we had was delicious and I took it upon myself to make sure none of it went to waste. I can’t help it. I’m a giver. 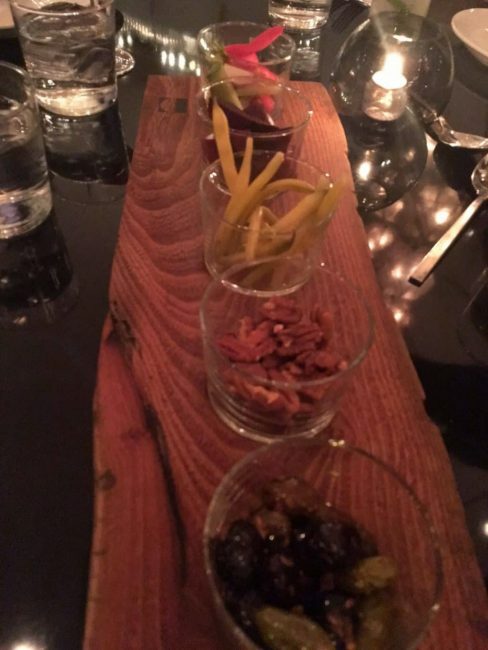 Yes, I am someone who enjoys the entire event of a meal. I love the presentation, the aroma, the textures, all of it. And this meal did not disappoint! Even items I wasn’t sure about ended up being wonderful. 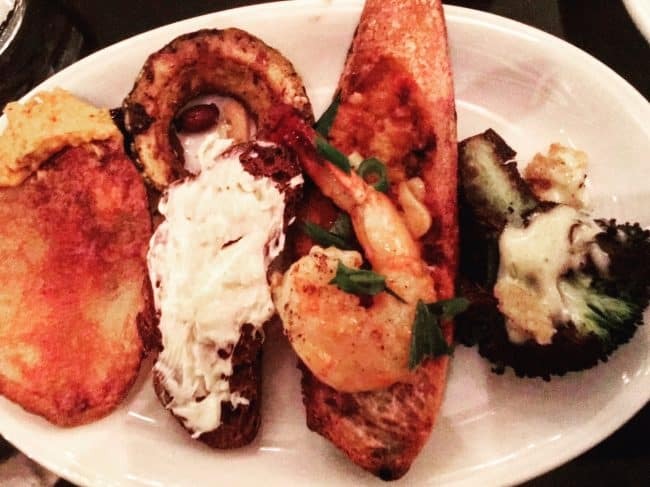 If you don’t plan to stay at The Durham Hotel, it’s worth a visit just for the appetizers! We set out on foot to see what else Durham had in store for us. Wandering around and popping in for drinks at other local spots was a lot of fun and ending with incredible late-night pizza at Pizzeria Toro was just about as good as it gets! The first pizza we ordered to share arrived at the table and we immediately asked for another! Seriously, it was that good. We all agreed the white pizza was far and away the favorite so definitely try it if you go. I won’t lie when I say I wished we could have eaten in every restaurant we saw. They were all so beautiful and fun looking. If you’re planning a Girls’ weekend at The Durham Hotel, maybe make it 2 or even 3 nights so you can really enjoy this fun scene. 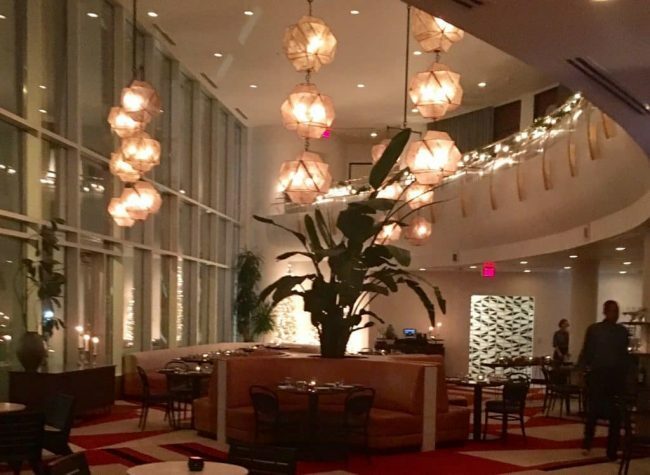 DPAC is a quick Uber ride away so you could even catch a show while you’re there. 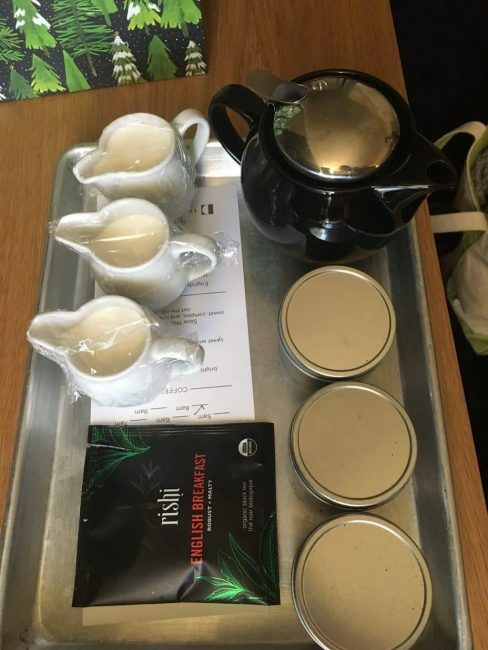 We had coffee (and tea) service the next morning, which means we placed our order on the door before bed with our choices. When we woke up, the beans were freshly ground and ready for us! The coffee is also local and was just what I needed to get going. Our adventures in Durham came to an end with a yummy breakfast at local hotspot, Guglhupf. This was a few miles away but worth the drive for great food in a fun and bustling Sunday morning atmosphere. I can see why this place was so busy. If I were closer, I’d be there every weekend too! 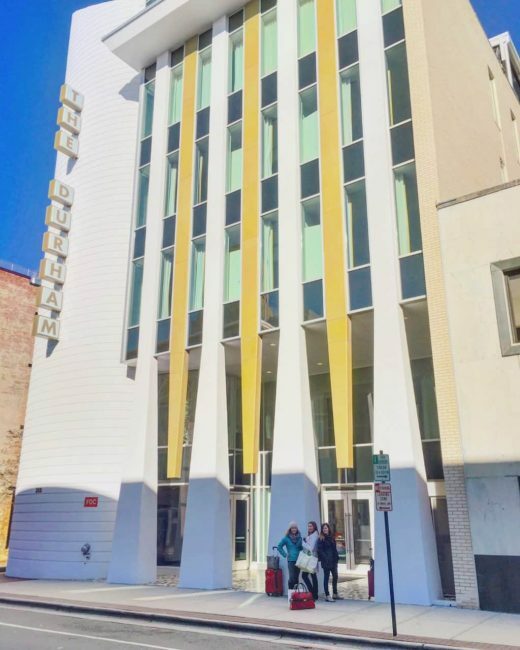 I said goodbye to our fun girls’ weekend at The Durham Hotel and went back to reality feeling refreshed and thankful for such great friends who really get me. We had a great time and I hope to do it again! If you haven’t taken some time out for a girls’ weekend in a while, I highly recommend it no matter where you go. You only live once, right? Planning a trip to Durham? Save this post for later! Disclosure: The Durham Hotel provided our room and amenities. All opinions are true reflections of my experience. I love the interior of that hotel! So swanky. Looked like a great time and a good reminder to me to try and plan a weekend away! Sounds blissful right about now! !